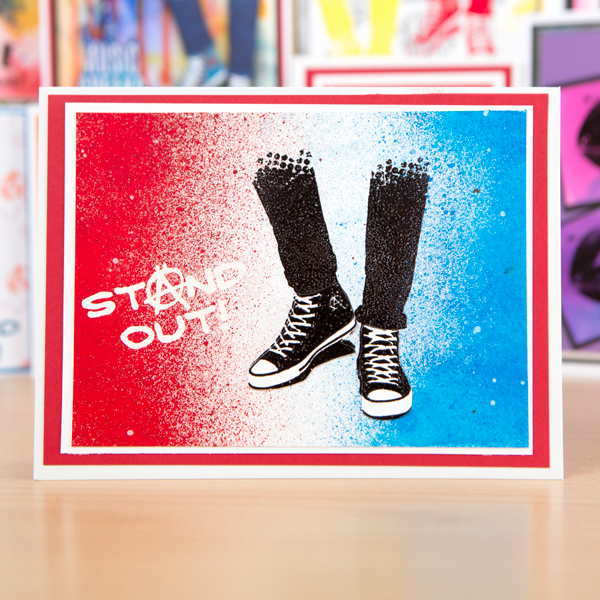 This week I am sharing a card made with another of the fabulous new stencils – the Grungy Union Jack. I teamed it with the Dare To Be Different stamps…..and did just that, by colouring my flag in alternative colours. I used Distress Oxide inks and grunged them up a bit with the addition of some spritzed water. The lips are embossed onto heat resistant acetate backed with white card. Such a brilliant card design Teresa! Love the alternative colours, and the lips look amazing! We will be back tomorrow with gorgeous new inspiration from Pauline. You can watch our shows on catch up for 7 days online too! Make sure you tune in or set your recorder for the shows, as Mark and Pauline have some fantastic demos planned! Thanks for stopping by today, have a great evening! Hi there! 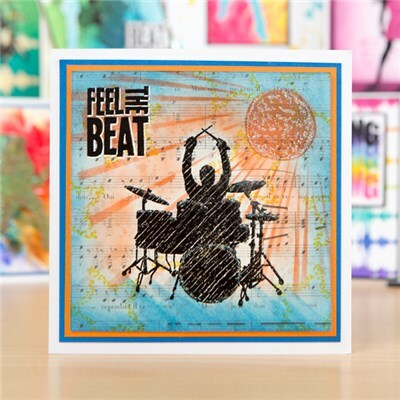 We are back with another awesome card that Mark demonstrated on Create and Craft TV last week. This card was originally created for our March show but, as the face stamps sold out so fast, Mark didn’t get to demo it! After sharing photos of it on social media, he had been inundated with requests to show how he created it..
a genius creation! It is certainly very striking!!! Mark had stamped and embossed the open eyes from our Face it set onto some smooth stamping card, then masked them using pebble drawing gum. Once the masking fluid was dry, he created a colourful strip across the card by spritzing various colours of Brushos. Sadly he didn’t take a photo of this part, but after making a mistake with stamping a quote below it, he had to come up with a new plan! he chopped the card into 2cm wide strips which started to look really funky! And so his idea was born! He proceeded to cut each strip diagonally to 1cm down each strip, repeating top and bottom. Mark then placed these on a piece of black card.. how cool does that look! He stuck the black strip down onto a card blank and decided on the perfect quote! Sometimes making a mistake can lead to something awesome!!! It’s been great to see quite a few people inspired to try this idea already! We will be back soon with more inspiration! We loved being part of Create and Craft’s 14th Birthday event and wow what an incredible hour it was!!! You may remember back in March our Face it collection sold out in 26 minutes.. well this time they sold out in even less than that!!! Our Curious Cats set flew out just as fast too! the background was created with Brushos. Mark then stamped the circles from our Universal set in a few colours and then distressed the edges of the card with black soot distress ink to make the colours stand out even more. After flicking some ink to add even more interest to the background, Mark then rubbed off the masking fluid to reveal the crisp clean quote! The background on this next card was created with Distress Inks..
Mark stamped the Creativity quote using black Versfine ink, once the background was dry. He then stamped and embossed the large spirograph stamp from our Visometry set twice onto a spare piece of the same background card, and cut them out using a craft knife, cutting one in half. A torn strip of black card was used to mount the shapes for a super cool look! Gorgeous! 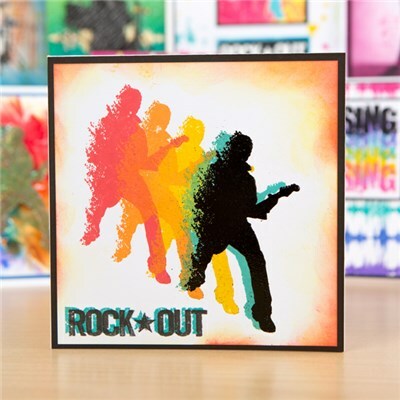 The next card features the closed eyes from our Face it set, and our stunning Stay Strong stamp..
card that had also been sprayed with Lindy’s before being added to a black mat and adhered to card blank. We will share more of Mark’s demos here on the blog later today! Thanks so much for visiting our blog today and don’t forget to find and follow us on your favourite social media platform! Hi! Thank you for visiting our blog today. We are back with more gorgeous inspiration ahead of our Create and Craft TV show this Saturday! More details at the end of this post. 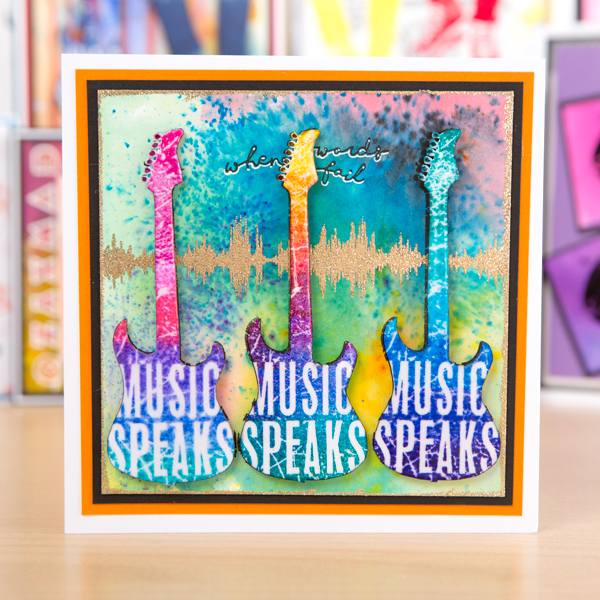 This week I have been playing with my Distress Oxide inks to create a fabulous background for this beautiful sentiment stamp from Visible Image. I applied different colours of Distress Oxide inks to my card base, spritzing with water then heat dryin before adding another colour. I continued until I was happy with the result then stamped the dotted circles also using Distress Oxides. The doodled circles are stamped with Jet Black Archival ink, and the sentiment is stamped with Versamark and embossed in black. I love how the Distress Oxide colours sit on top of each other – it makes for some fun contrasting patterns. We absolutely adore this card! Teresa is creating some amazing things with the oxides! You’ll find more fantastic cards and projects from Teresa over on her blog. Pauline will be here tomorrow morning with a fabulous sample created for the show! Hi there! We are getting excited for our Create and Craft TV show this coming weekend! Mark will be demonstrating lots of awesome stamps including some of our brilliant and very inspiring quotes. This week we are showing you some previews of the samples our amazing team have created for the show! You may remember my YouTube video a while back, using stamps with my Gelli plate to create fun backgrounds. and embossed with black and white WOW Powders. I added some white highlights to the ‘Create Yourself’ with a gel pen. I love the slightly grungy feel to this card and the fact that it is totally unique – I could never repeat the background exactly. We’ll be back with a fabulous card by Pauline Butcher a little later! on the Create and Craft TV channel this Saturday! Wherever you are in the world you should be able to either watch the show live on TV or online! OR you can catch up with it any time over the following week via their 7 day catch up service online. and Mark has some fantastic demos planned! We will be back sharing loads of gorgeous NEW stamps inspiration with you early next week. Thanks for visiting our blog today! Have a great weekend. Hi there! Thank you so much for visiting our blog today! We are continuing with the amazing inspiration created for our Create and Craft TV shows this coming weekend. Are you looking forward to watching Visible Image on Create and Craft this week??? I certainly am, and for the first time all my friends in the US are too!! Just in case you haven’t heard, Visible Image are making their debut on Create and Craft USA on Friday 9th September 13:00 EST & 16:00 EST (6pm & 9pm UK time)……but don’t worry, fellow Brits – you can watch them here on Create and Craft UK on Saturday 10th September at 4pm too!!! I was inspired to create my ‘vinyl’ records as the ripple stamp reminded me of the grooves in records. I die cut some circles of black card and embossed the ripple stamp on them using WOW Powders Black Glint embossing powder. I then die cut the centres from coloured card, added some detail with a white gel pen and cut the centre holes out. The background was created with DecoArt Media Fluid acrylics and my Gelli Plate. I stamped the words and small circles with black Archival ink. 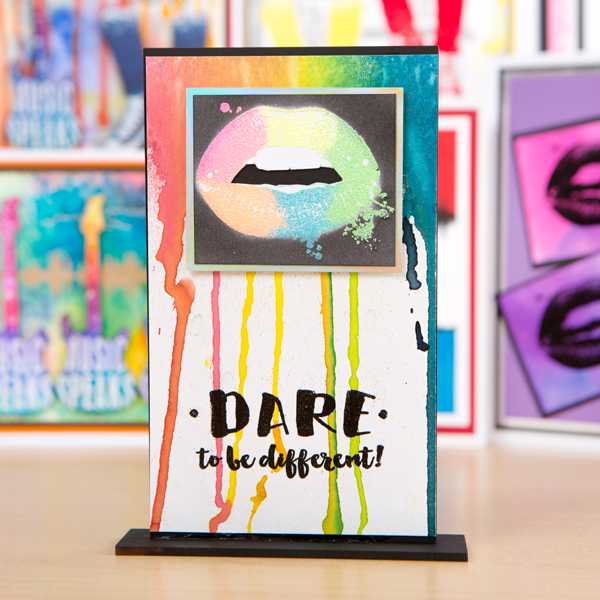 These stamp sets are so versatile and I hope that my project and those of my fabulous team mates inspire you to make a purchase. Please tune in to the shows on Create and Craft UK/USA – Mark and Pauline have some fabulous demos lined up and there will be multi-buy offers that you won’t want to miss!! Totally awesome card Teresa! Such a brilliant idea… Thank you so much ♡ You’ll find more of Teresa’s superb creations over on her blog. We cannot wait to show off all the samples created for the shows, and we will be sharing them here on the blog over the next week. You will find lots more inspiration and all the details you need for this weekend’s shows over on our Facebook PAGE! Hi there! Thank you for visiting our blog today! This week we are previewing some of the stunning samples made for our shows on Create and Craft TV this coming weekend. I absolutely LOVED putting this piece of work together, especially as the Just be Happy slogan pretty much sums me up right now ( and it has nothing to do with the kids being back at school this week, either!) I prepared the monolith with white gesso, then white acrylic paint, and stamped the arty splodges ( from the new version of Music on World off) directly onto the MDF with distress ink. I added the sun effect by masking the largest circle , then stamping, applying white embossing powder and heat embossing The Ripple Effect and added the smaller circles randomly too. The funky large heart is a new add-on to the set Own Kind of Beautiful. Reverse: Pinks and greens and Be your own Beautiful – but two of the butterflies have been stamped onto shrink plastic – now that was fun! I made 3 large ones on plain white card and matched them all up. The wrap with the words on came about as I was test-stamping the colours on an off-cut from a previous card – and I thought ‘ooh that works for me!’ so I put my text on both sides of my wrap, sealed it at one end and carefully positioned it on my monolith. Dare I say that this is my favourite piece of work from the new Summer release? I love everything that Visible Image has ever released but there is something really special about these stamps that just makes me…HAPPY!!! Thanks for reading! 6pm and 9pm UK time! We hope Nicky has inspired you.. you’ll find more of her gorgeous work over on Nicky’s blog. Come back and see us tomorrow for an awesome card by Teresa!!! We’re also on instagram and pinterest! Hello there! It is an incredibly exciting week here at Visible Image leading up to our shows on Create and Craft TV this weekend! 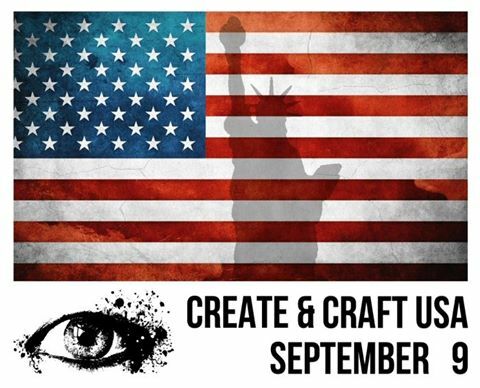 On Friday (September 9th) we make our debut on Create and Craft USA! AND… We are on Create and Craft TV here in the UK on Saturday (September 10th) at 4pm! Mark and Pauline have some amazing demos planned, and the Design Team samples are incredible! All week we will be sharing some of the outstanding cards and projects created by our brilliant team for our shows. When I saw the Summer Release 2016 from Visible Image… this idea started growing in my head and I had so much fun creating it. Starting out with a plain wooden box that has a little window I ended up with a finished project that has a lot of meaning for me. I’m not going to tell you how I see it, what I was thinking making it. Everybody should fill it in, in their own way. But I can tell you that every structure and every single stamp was placed with a meaning, they all carry a little part of me. We hope you will come back tomorrow to see a fabulous project by Nicky Gilburt! Thank you so much for visiting our blog today. We’re really excited to be back on Create and Craft TV tomorrow at 1pm with an awesome show! With brilliant demos from Mark and Pauline! There’ll be some fantastic multi-buy offers on our stamps! this weekend to celebrate their 13th Birthday!!! with FREE POSTAGE from Create and Craft! reversible to suit your mood or colour scheme! you’ll find all the items HERE! Thank you for taking time to visit our blog today. 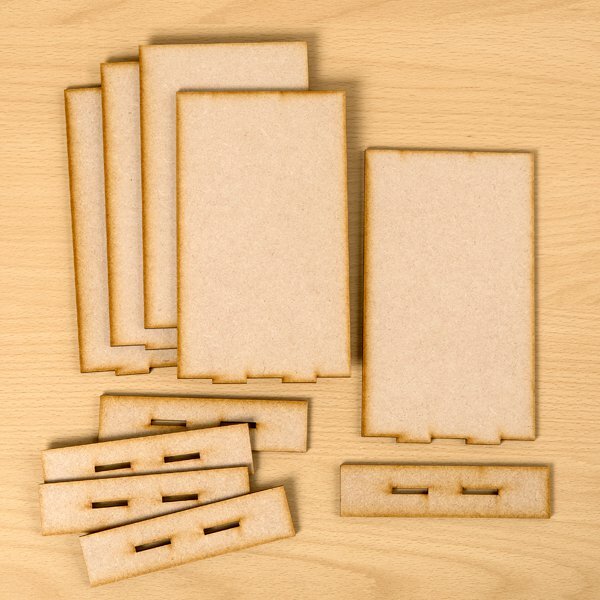 Launching 6 BRAND NEW sets of stamps and our awesome MDF Monoliths! 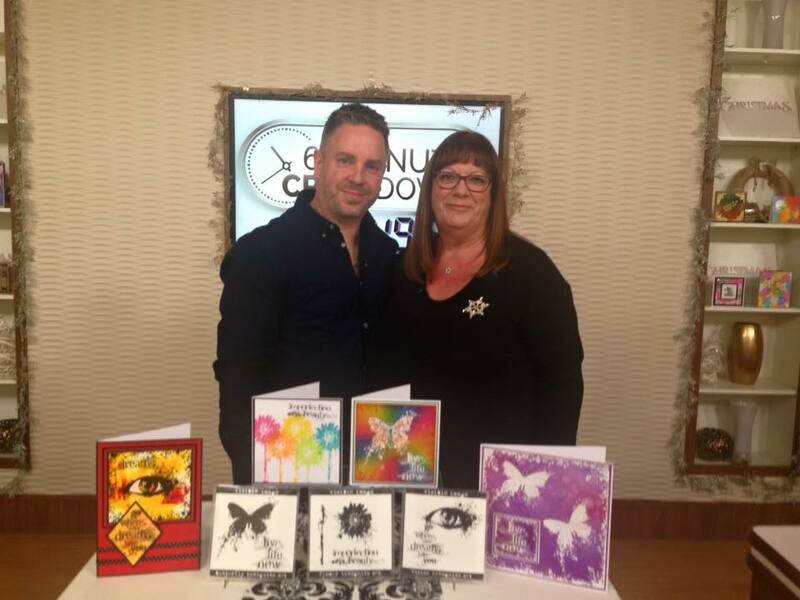 Watch Mark Alexander, designer and creator of Visible Image stamps, and our fabulous demonstrator Pauline Butcher demonstrating live on the show.. they have some awesome projects planned! OR watch us live on the Craft and Craft TV website! You will find all the show details and products HERE! And you can place your order before the show, then sit back and watch Mark and Pauline’s demos! 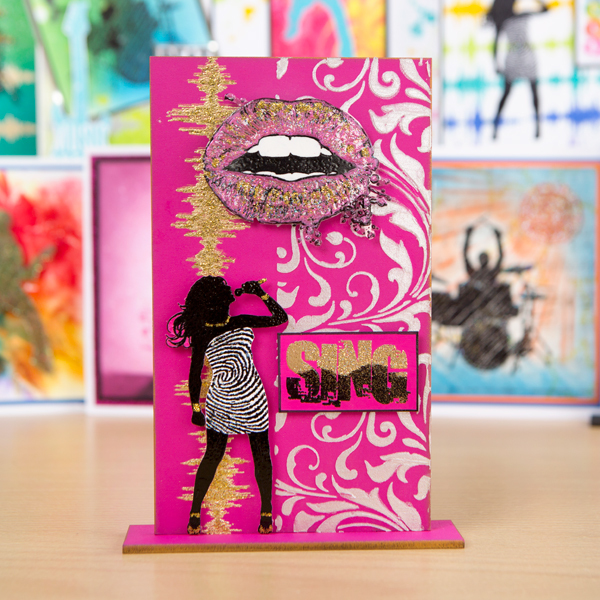 Fantastic images and inspiring words for your cards and mixed media projects. There are lots more awesome samples… we don’t want to show you everything just yet! So we hope you will tune in on Sunday! And if you have missed any of the last few weeks Design Team inspiration posts, you will find them HERE! We’ll be back on Monday will the low down on the show! Good Morning and Happy Saturday to you! Today we are sharing Pauline’s amazing demo cards from our Create and Craft TV show last Saturday.. what an amazing show it was! Mark and Pauline managed to get 5 demos in between them which was awesome..that’s down to some fantastic prepping! The first demo was using the stamp set… Angels are Near. For the background, I took a piece of white Centura Pearl card, and using 3 Distress ink colours, I blended them, spritzed it with water, and blotted with kitchen towel. Using the feather stamp covered in Versamark, I stamped in the middle, then heat embossed using white detail powder. Using the feather again, but only the splatty end of it, and a gold ink pad, I stamped around the edges of the inked background, I then applied gold gilding wax with my finger around the four edges. mat andd layered it onto a card blank. The feather was stamped again onto a piece of heat proof acetate, with versamark, heat embossed using the gold sparkle EP again, and fussy cut, this was applied to the card using 3D glue. The stamp set is called Butterfly Inkognito Set. I stamped both the butterfly and the sentiment on a white piece of card, using a Versamark pad, and heat embossed with Clear powder, when it had cooled, I blended over the stamping, using 3 colours of Distress ink, and like magic the image and sentiment appear, I then spritzed with water and dried. Using a tacky glue on my index finger I went around the edges of the card, then sprinkled glitter on it to give a sparkly edge. I stamped the butterfly using versamark, onto heat proof acetate, and heat embossed using a white detail powder, I folded the acetate so’s that the butterfly’s wings were together, and cut some rounded wings, taking off all the ink splats, this was attached to the card leaving the wings free to flutter, I added glitter glue for that extra sparkle. The stamp set is called Behind Every Mask. Taking 2 similar colours of Distress ink, I used Picked Raspberry and Spun Sugar, I put the ink straight from the pads onto my glass mat, sprayed water onto it so it was nice and wet, and ‘smooched’ (my term, lol) my card into the mixture to cover the card with a coloured wash, I dried it straight away using my heat gun. Using Picked Raspberry, I edged the cars with my blending tool. Now to the bit that I did’nt show on TV, because of time… I mixed a small bit of gold mica powder with Picked Raspberry and water, and using a paint brush, I went around the edges of the background, I also did the same to a small piece of card for the sentiment. I added a touch more water to the mixture that was left, loaded up my paint brush with it and flicked it over the coloured background. Taking the image and the sentiment, I stamped them both using Picked Raspberry, I also coloured in the iris’s of the eyes with a blue pen, and added a dot of gold mice & water to the middle of the eye. I stamped the mask image with Versamark onto heat proof acetate, then used some yummy Pink/Gold sparkle EP and heat sealed it, I fussy cut it, also cutting out the eyes too, and attached it to the card with 3D glue. Thank you for watching the show, and also if you emailed in thank you too. Check out the Visible Image Facebook Group, lots of daily inspiration, news and general chat, with lovely people who are fans of the awesome stamps. I wish you and your families a very very Merry Christmas, and have a fabulous New Year. Thank you so much Pauline for taking the time to share how you created these stunning cards, and thank you again for such awesome demos on the show! You are a natural in front of the camera! We have received so many orders, and so many fantastic emails, messages and comments… quite overwhelming! Thank you so much for loving what we do here at Visible Image! We have a very busy Saturday here, cutting and packaging a HUGE pile of stamps! Hope you have a good day, and you are feeling more prepared for Christmas than we are!!! We’ll be back with Mark’s demo cards in the next few days. Hello there! Thanks for coming to visit our blog today. 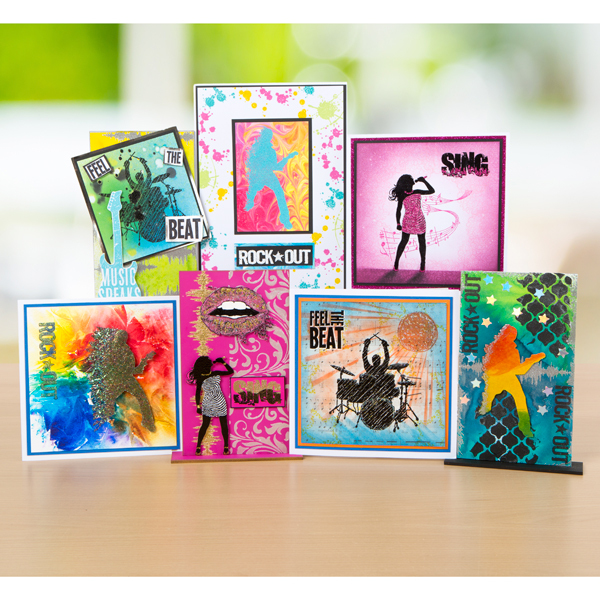 We’re so excited to be on Create and Craft TV tomorrrow… Saturday December 12th at 11am with our awesome stamps! Join Mark and Pauline for some amazing live demos! Mark not only designs our stamps, but he also makes and hand cuts them all too! Mark has some brilliant demos lined up for the show! Pauline continually wow’s us with her creativity, and you’re going to love what she is creating live on the show! It’s Pauline’s first time demonstrating live on TV, but we know she’ll be fabulous! Sky 674. Freeview 36. Virgin 748. Freesat 813. You can also watch online on the Create and Craft TV website! Our show is due to be repeated on the Craft Extra channel at 1pm on Saturday too.. sky channel 675. Have a brilliant weekend and we will be back with more gorgeous cards and projects from our wonderful team, along with photos of Mark & Pauline’s TV demos next week! Thanks again for visiting our blog today!